The Foyer Hongrois, a publicly-funded Hungarian retirement home in Montreal, decided to eliminate its entire library, citing a lack of space in the facility and low circulation figures. Sparking significant dismay among local Hungarians, the Board of Directors decided unilaterally to dispose of more than 2,000 Hungarian-language books. A large dumpster was parked at the side entrance of the residence and it was filled to the brim with books of all genres and varieties, before being hauled away for recycling. Security camera footage recorded volunteers carrying out piles and piles of books, tossing them into the container. The still shot, once the dumpster is completely filled with the discarded library, is a disquieting sight for any book lover. 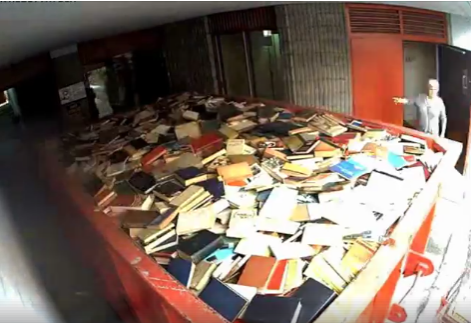 Two thousand Hungarian books were tossed into this container at the Foyer Hongrois in Montreal a few days ago, before being taken away to be destroyed. The Foyer has eliminated its entire library. The Foyer Hongrois explained that space in the facility is at a premium and that the room occupied by the former library will be transformed to accommodate health care staff from the CLSC, Québec’s network of local clinics. The Foyer also maintains, following sharp criticism of this unilateral decision, that its board was under no legal obligation to consult with anyone prior to having the books destroyed. The reaction in the community was generally one of shock and anger. While it is understood that the number of people in Montreal who can read Hungarian continues to dwindle and books do take up lots of space, it would have been more helpful had the Foyer announced its plans prior to the library’s destruction, allowing for locals to salvage what they could of the collection–or at least help explore possible alternatives. I don’t understand the process. The board must have made the decision without consulting the Hungarian speaking community. Had they deliberated over the options, one of those should have been offering the collection to one of the universities in or around Montreal. In the time of eBooks the view of discarded books is still heartbreaking. Obviously lack of consultation/ communication and consequently half-baked or dumb decisions are not the exclusive domain of the Orbán regime. I would have driven up from New York to salvage and home them. This was thoughtless. If you are sitting fat and rich in the chair and you need more room and you can order a Container with just one phone call … what a sacrilege. I have never managed to throw away a book. If this happened to Islamic books you can be damn sure they’d do anything in their power to relocate the entire collection in mint condition, but screw Europeans right? It’s not like there was an established community to ask about this or anything. destroying books is a little bit killing a part of yourself. I have seen a Hungarian textbook Geography in which the EU is portrayed, Germany as mother sow with the other member countries as a piglet and Hungary does not hang on the teats, like the others, but happy eat a few crumbs. A few days ago you could still see the page, now it is no longer visible. If such a book in the container, then the container is justified. It doesn’t justify every book tossed. Plus propaganda illustrations are, imho, important to preserve and study as part of history. How old is the picture? It sounds like Gillray’s Georgian British era “More Pigs than Teats.” Are we throwing out British caricature books of the Georgian era, too? If you go to the link it says 2016 and it’s a textbook … what’s going to tell such a caricature and how can you treat it scientifically later? Anyway, I find it an insult if you steal my money and put the victim me in a textbook as a pig. What is it compared to the Toronto Dr. Janos Halasz Library close to 30,000 Hungarian books in 2011, where about 30,000 valuable Hungarian books were locked up for 5 years by an arbitrary decision of an unauthorized “President” of the Hungarian House, followed by several other arbitrary decisions, resulting to the disappearance of about 85% of North America largest Hungarian public library. None of those who were responsible for that destruction were hold responsible, retained their positions, even they shine as the best friends of Hungary. Unfortunately we always had real patriots, and as many, or more, infiltrated enemies, traitors of our national common interest. However, I consider those hidden or direct allusions that those anti-hungarian actions would be done with the consent of the present Hungarian government, as a desperate accusations by the loosing liberal opposition. In one word SHOCKING!!!! They used to destroy books in the 1930s of Nazi Germany! !! But there is a difference between burning books as signs of hatred or destroying books for lack of space and laziness … or? Unfortunately only in German or luckily … and I can find more dirt. Are you saying these books were definitely in the collection? And that all of the thousands of books were like this? It says literature, poetry, handicrafts. Probably we are missing the real sin in Quebec: ce ne sont pas des livres français. I am an Oak, tho’ fall’n indeed! But by the blast that laid me prone. To falling in a GLORIOUS CAUSE? Nice Melody I told … fent felolvashatja. About Miguel de Cervantes his great-grandparent at that time in Spain were Jews who were forced to accept the Catholic faith. At that time the Jews were walled in and a fire was lit under it … good argument. These new Catholics, despite all of them, have been considered Jews, and so Don Quixote has emerged and the fight against windmills. The phonetic play on Don Quixote in German. Well, I think we should all choose a time and a windmill. … imagine how difficult it was then to write a book from which you could live and also die. There were still writers hierarchies that caused problems among themselves and also not to step on any of the many rulers feet. Destroying history is what (((they))) do. Anthony that’s too loud, I think.